As one of Vernon’s oldest schools, St. James School is a landmark in our community with a rich tradition of faith and excellence in education. St. James School was founded in 1956 by Monsignor John Miles, the Catholic parish priest between 1944 and 1971. It was Monsignor Miles who initiated and played the most significant role in the inception of the school and its infancy. There were many hurdles to overcome, including purchasing the land, persuading the Sisters of St. Ann to staff the school, and fundraising challenges. Yet Father Miles persevered with his vision and efforts “for our children”. Once he obtained the necessary approvals, he proceeded in an expert fashion with the building of the school. Plans were drawn up by a Kelowna architect and a professional fundraising company from New York was hired. 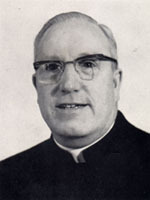 A parish building committee of about one hundred men was established in 1955, chaired by Tierney O’Keefe and Hank Murray. It should be noted that Tierney O’Keefe’s father Cornelius O’Keefe, the first white settler in the area, was a Catholic, and the first Catholic Church was built on his homestead. 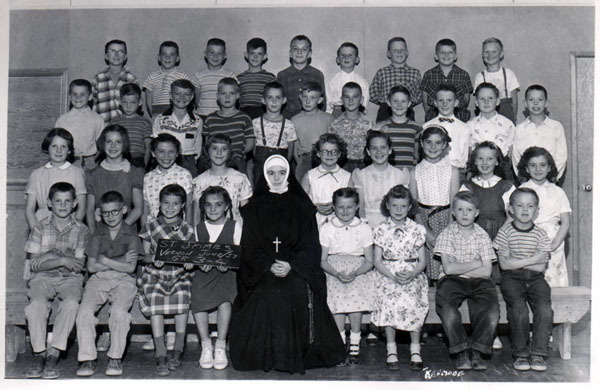 St. James School opened its doors on September 10th, 1956, with 147 children enrolled. The original structure was built on one level and instruction was provided by the Sisters of St. Ann for Grades 1 through 6. The nuns made up the entire staff of the school in the early years, wearing full habit and providing firm discipline – the sisters earned $50 per month. In 1960, the first lay teachers joined the staff. In 1962, registration was broadened to accept children of other Christian denominations and increased numbers of First Nations students. The opportunity to attend Kindergarten at St. James School began in 1975. In 1986, the Parish Centre was added on to the south end of the existing school, providing a gymnasium for the school children and a venue for events sponsored by St. James Church, the Knights of Columbus, the Catholic Women’s League and others. Grade 8 students were accepted for the first time in September 1994, Grade 9 in September of 1995 and Grade 10 in September of 1996. The Middle School has since been discontinued but Kindergarten, and Grades 1 to 7 continue a successful operation. The school has seen many changes since its beginning in 1956. Sr. Mary Rita Carey, the last nun to teach at the school, retired in 1997. Enrolment has diminished from its peak in the early 1960s – an issue also facing public schools in the region. Funding is an on-going challenge, but a decision by the provincial government in 1987 to give independent schools 50 per cent funding for operations provided a much-needed financial boost. The curriculum at St. James School is provincially recognized and uses many of the same resources as the public schools. Motivated by a Christ-centred vision of humanity and human history, the school promotes the formation of the whole person. Such formation embraces not only intellectual but also physical, emotional, moral and spiritual dimensions of student growth. This broad education prepares students for the challenges of life as adults in our multi-racial, multi-cultural province. At. St. James Catholic School, students receive a strong academic education as well as a solid moral and spiritual foundation.